FY6600 series dual-channel function/arbitrary waveform generator is a set of function signal generator, arbitrary waveform generator, pulse signal generator, frequency sweeper, counter and frequency meter in one function, high performance, cost-effective, multi-function Signal generator. Rich shortcut keys greatly simplify the complex operation process and greatly enhance the operability of the instrument. Users do not have to spend a lot of time to learn and become familiar with the operation of the instrument, and they can use it proficiently. Particularly suitable for electronic enthusiasts, scientific research institutions and high-tech enterprises. The instrument adopts DDS direct digital synthesis technology to produce accurate, stable, low-distortion output signals. All parameters are calibrated by internal programs; standard PC software, all functions of the instrument can be controlled by the host computer software, and also can use the upper position. The machine software saves the arbitrary waveform and saves the output waveform to the signal generator; the communication protocol is open, making the secondary development very simple; large-scale integrated circuit, surface mount technology, high reliability, long service life; and output short-circuit protection Yes, all signal outputs can work 60s under load short-circuit conditions. 1. The FY6600 uses a professional 14Bit high-speed D/A chip instead of a 12-bit D/A resistor network built with several inexpensive resistors. The higher the resolution, the smoother the waveform details. It is recommended to use an oscilloscope to reduce the amplitude resolution and time base to observe the details of the sine wave. The waveform detail and smoothness of the two solutions will immediately jump on the paper. 3, FY6600 series waveform memory depth upgrade to 8192 * 14bits, high-precision signal details can be restored. The waveform length is 4 times that of your partner. 4, the industry's original very practical VCO function, see the feature introduction. 10, small signal is particularly good, FY6600 can output 1mVPP small signal amplitude resolution of 1mV, and can be done 1mVpp, 10mVpp, 100mVpp, 1Vpp and other different step values, the maximum amplitude range 1mVpp~20Vpp stepless adjustment . 13, more abundant waveform types, the instrument not only presets 33 kinds of common waveforms for the user, but also provides users with up to 64 groups (8192 * 14Bit) of user-defined waveform storage space, the user can use the host computer provided by our company Software editor download; it is worth mentioning that our pulse wave pulse width not only supports the duty cycle adjustment method, but also supports the pulse width to be accurately set between 20nS-1S (our friend's products mimicking our interface do not have this adjustment Way). The instrument output waveform totals 97 groups. 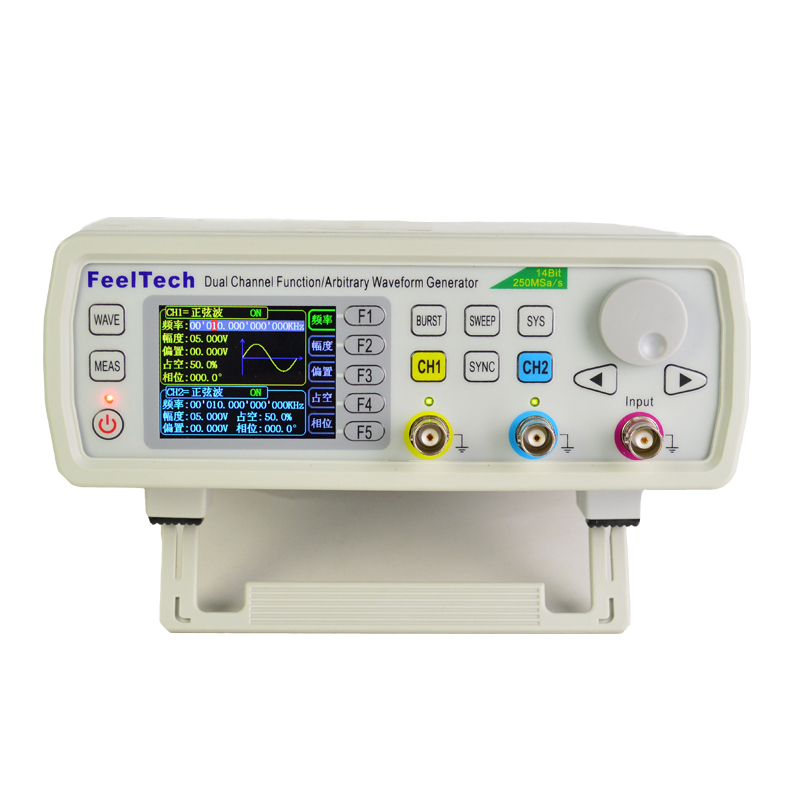 15, more comprehensive measurement function, the instrument can measure the signal frequency, period, positive pulse width, negative pulse width and duty cycle, and all parameters are displayed in the same interface, do not need to flip back and forth view; counter function has DC And AC two kinds of coupling methods, effectively solve the problem of AC coupling count inaccurate. 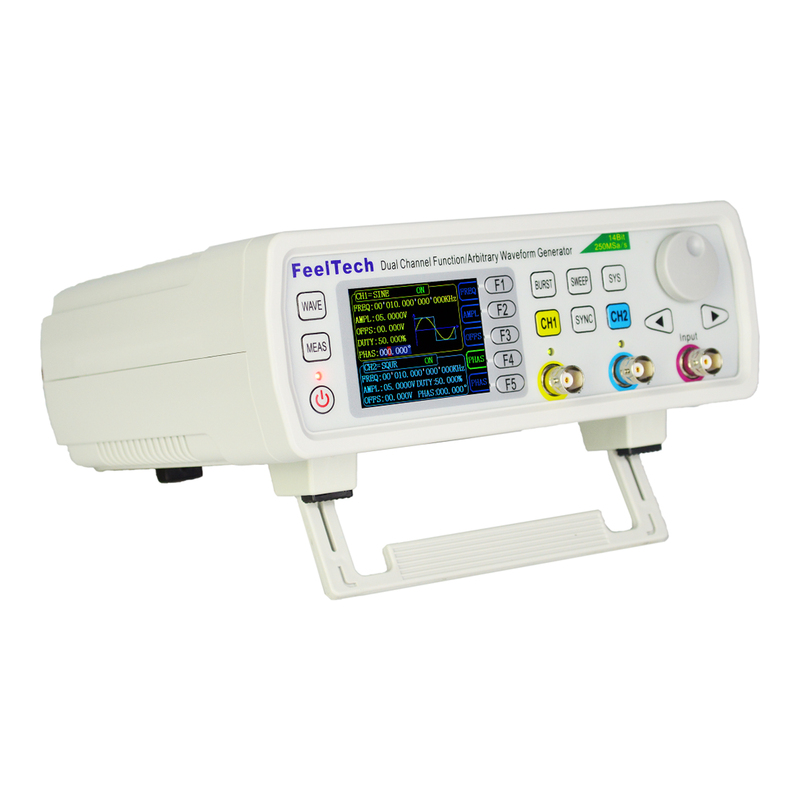 The maximum measurement frequency of the instrument can reach 100MHz, and the minimum measurement frequency is 0.01Hz. There are still some advantages that we will not list. We would like to share with you. 1μHz (Min. resolution can reach 1μHz on all frequency range to ensure adjusting accuracy under high frequency. For example, it can output 10.000000000001MHz signal). Sine, Square (Duty Cycle adjustable), Pulse (Pulse width and cycle time can be set accurately), Triangle/Ramp, Sawtooth Wave, CMOS, Four channels TTL, DC, Half wave, Full wave, Positive Step, Inverse Step, Positive Exponent, Inverse Exponent, Lorenz Pulse, Multitone, Noise, ECG, Trapezoidal Pulse, Sinc Pulse, Narrow Pulse, Gauss White Noise, AM, FM, and other 64 sets customer-defined waveform. All channels can work more than 60 seconds when the load is short-circuited. Starting position and Finishing position can be set arbitrarily. voltage controlling frequency (VCF), voltage controlling amplitude (VCA), voltage controlling offset, voltage controlling duty cycle. Can Amplitude Modulate (AM) or Frequency Modulate (FM) by external analog signal. Square with 50% duty cycle. 2.4 inch, TFT Color Display. Command line mode, providing communication protocols. Can be turned on/off by setting.